This past year when I was in 6th grade, I thought about what I could do during my summer vacation. 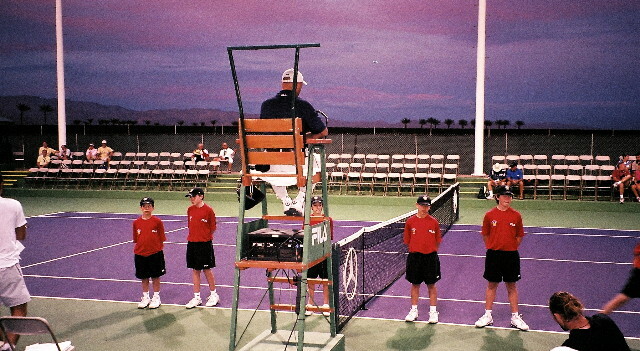 During the school year, I like working at the BNP Paribas Open in Indian Wells, so I wondered if I could volunteer as a ball kid at other tennis tournaments in Southern California. Because I don't like the summer heat in the Desert, I wanted to volunteer to work as a ball kid at two tennis tournaments in Los Angeles. In July, I worked at the LA Tennis Open which was held at UCLA. Formerly called the Countrywide Classic, this tournament is a U.S. Open Series tournament which allows professional mens players to earn points on the tour before the U.S. Open. Past champions include Pete Sampras and Andre Agassi. 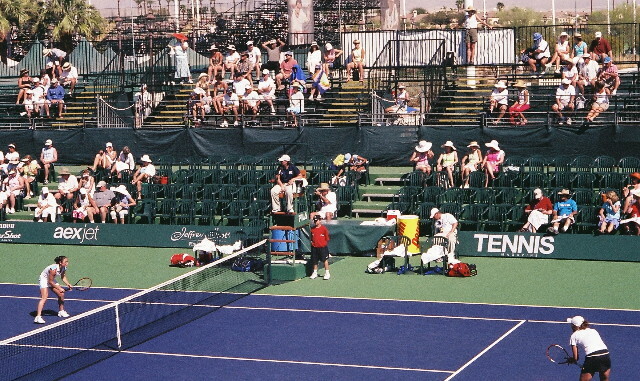 The second tournament I worked at this summer in the Los Angeles area was called the LA Women's Tennis Championships. This tournament, formerly called the East West Bank Classic, was held in Carson in August at the Home Depot Center and is where the LA Galaxy Soccer team plays. Past champions include Steffi Graff and Dinara Safina. As a ball kid, my job is to work on the court during tennis matches, collecting tennis balls and tossing them to the player who is serving. To qualify to be a ball kid, you must have knowledge of how to keep score in tennis, run fast, roll the ball accurately and be responsible for holding an umbrella for the player while he or she is sitting down. In general, the age requirement is usually 12-13 years old. I think there are a lot of benefits to being a ball kid. I love to work as a ball kid for the world's top players so I can see their emotions during the match. Sometimes they are really happy and enthusiastic and other times, they get really angry and mad. Also, when I am walking around at the tournaments, I get to see some of the players and ask for autographs. I have the autographs of Roger Federer, Rafael Nadal, Andy Roddick, Juan Martin del Potro, Tommy Haas, the Bryan Brothers, Mardy Fish and John McEnroe. Another benefit is that your meal is provided during the day or session that you work. Usually, you get lunch tickets to purchase lunch or a voucher for a meal. My favorite place to eat at the LA Tennis Open is California Pizza Kitchen. Another benefit of being a ball kid is that you are given an official outfit to wear on the court. These clothes include shorts, shirt, shoes and a hat. I like to receive Adidas and Fila shoes and apparel. When you work as a ball kid, you get a credential which identifies you as someone who works at the tournament. By showing your credential, you get to go into the tournament any day for free and you get complimentary tickets for your friends and family. At the tournaments, there are booths which sponsor things, so you can pick up samples like sunscreen and mineral-fortified water. At the LA Tennis Open at UCLA, there was a booth sponsored by Electronic Arts featuring Wii Games. All of the ball kids got to play electronic tennis during the tournament when we got a break. Another benefit of being a ball kid is that there are sometimes exhibition matches between former world ranked players such as Pete Sampras and Jim Courier. This summer at the LA Tennis Open I worked as a ball kid for Tommy Haas, Mardy Fish, the Bryan Brothers, Sam Querrey, Marat Safin, and Pete Sampras. 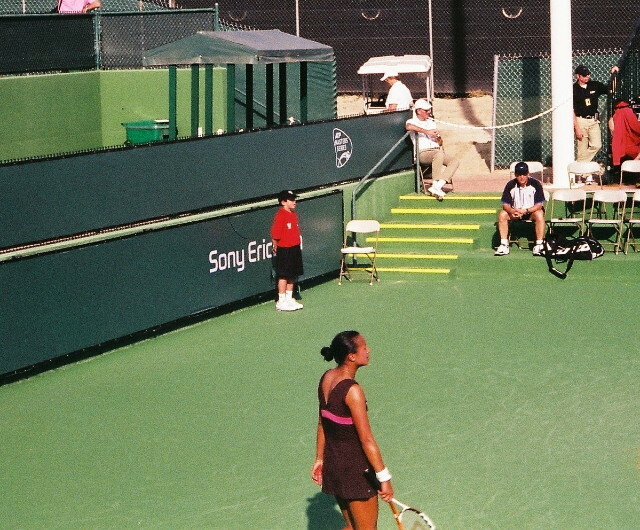 At the LA Women's Tennis Open I worked as a ball kid for Dinara Safina, Maria Sharapova, Zera Zvonereva, Daniela Hantuchova, Caroline Wozniaki, Ana Ivanovic, Agziezka Radwanska, and Shahar Peer. At the BNP Paribas Open, where I have worked as a volunteer for three years, some of the players I have worked for as a ball kid were Roger Federer, Rafael Nadal, Andy Murray, Novak Djokovic, Juan Martin del Potro, Andy Roddick, Lleyton Hewitt, and James Blake. The women players I have been a ball kid for are Dinara Safina, Maria Sharapova, Zera Zvonareva, Daniela Hantuchova, Caroline Wozniacki, Agnieszka Radwanska, Ana Ivanovic, Flavia Pennetta, Jelena Jankovic, and Svetlana Kuznetsova. Most of the players practice on the practice courts so everybody can take pictures and try to get autographs. Being a ball kid is very fun. I would recommend it for many reasons. You are helping your community. You get to be around world-class tennis players. You are part of a tennis tournament which is organized and a nice place to work. 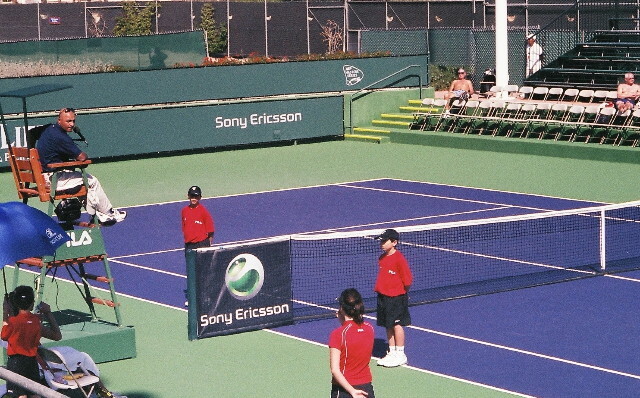 At the tournaments, most of the players practice on the practice courts so everybody can take pictures and try to get autographs.